Tudor Launceston | Launceston Then! There is little visible today of Launceston’s Tudor past but if you look carefully enough there are still signs. One such place stands out to any visitor of the its origins and that would be at what was once called ‘Kneebone Corner’ which lies on the junction of High Street with Broad Street. These two buildings remain relatively unchanged for centuries and give a clue as to how Tudor Launceston once looked. Although less visible much of the South side of Broad Street and Southgate Street still retain their Tudor foundations which, has been a cause of concern many times for the fire service. 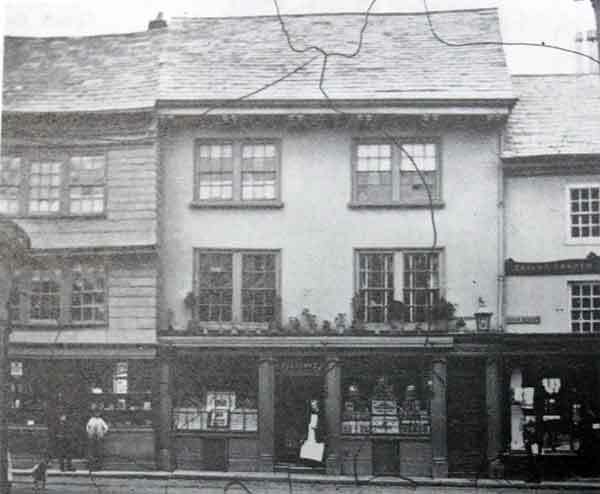 Further evidence of the Town Centre’s Tudor past can be seen in below which the Nicholl, Elllacott and Lyons shops c.1860’s. These were destroyed in the 1875 fire. The old house in which I was born you never knew. It stood where the present butter and poultry market stands (this was demolished in 1921 to make way for the war memorial). And was pulled down to make room for the present buildings while I was a boy at school in the year 1841. 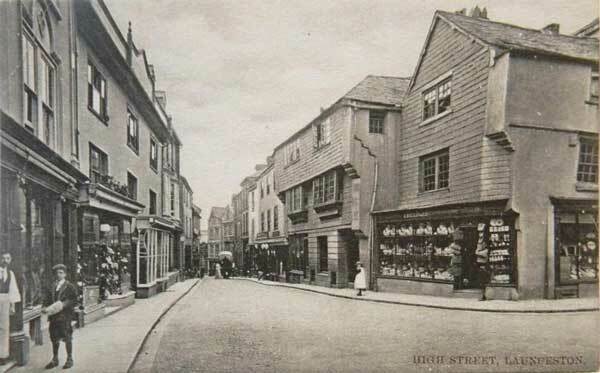 It was a remarkable old house without a bit of backlet or court, with street on three sides, on the other side a narrow house (occupied by a shoemaker called Rogers who carried on a large business) which was apparently jammed in between my fathers house and the Town Hall. The above ground plan was roughly how the three buildings looked Your Grandfather as you are aware began life as a grocer and watchmaker the latter business I never remember, and I cannot remember his commencing the Bank, the grocery business he carried on till I was about ten years old, but he was chiefly occupied in the Bank and your grandmother and I were his only helpers. I give you a basement and other plans of the old house as well as I can remember. The Dining Room was a fine room pannelled all round, with an ornamental ceiling and lofty chimney piece of the style of Charles I or rather to speak more correctly the style was Tudor, there being no classical or Elizabethan details, but it was not uncommon to build in this style in remote districts down to the middle of the 17th Century. The house had however been so patched and altered from time to time that its date was not very clear on its face and only one or two windows retained the original oak mullions. The date of erection was however on some portion of the lead work of the roof and was 1600 and something I forget the exact date, under the kitchen there was an arched reservoir for rain water collected from the roof and in the back kitchen a pump reaching to this reservoir; you may imagine that we were much more confined to the house than you are with a good garden to run in (by the time John was penning this letter the family were living in Eagle House). 28, Church Street which was formerly the London Inn (below) is another building with a Tudor past and a particularly interesting feature of the building and possibly unique in this area is a newel staircase. Other original features include granite fireplaces, a barrel-shaped ceiling on the top floor, doors and Tudor half-timber walls. On the ground floor, entering into a room with an Elizabethan oak doorframe can be seen an original two feet wide granite lintel over a fireplace. 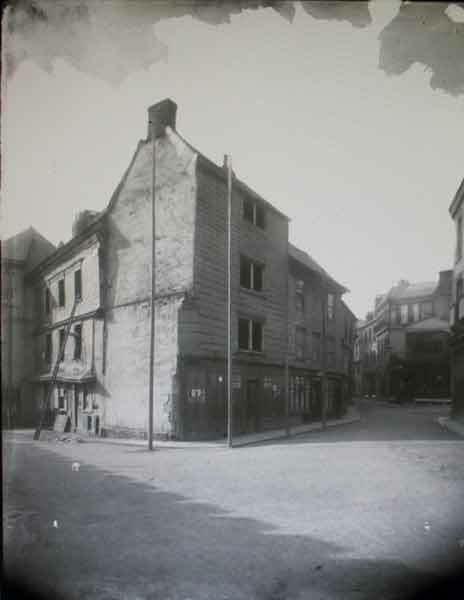 Above is a photo dating from around 1890 that shows the Tudor building’s at No. 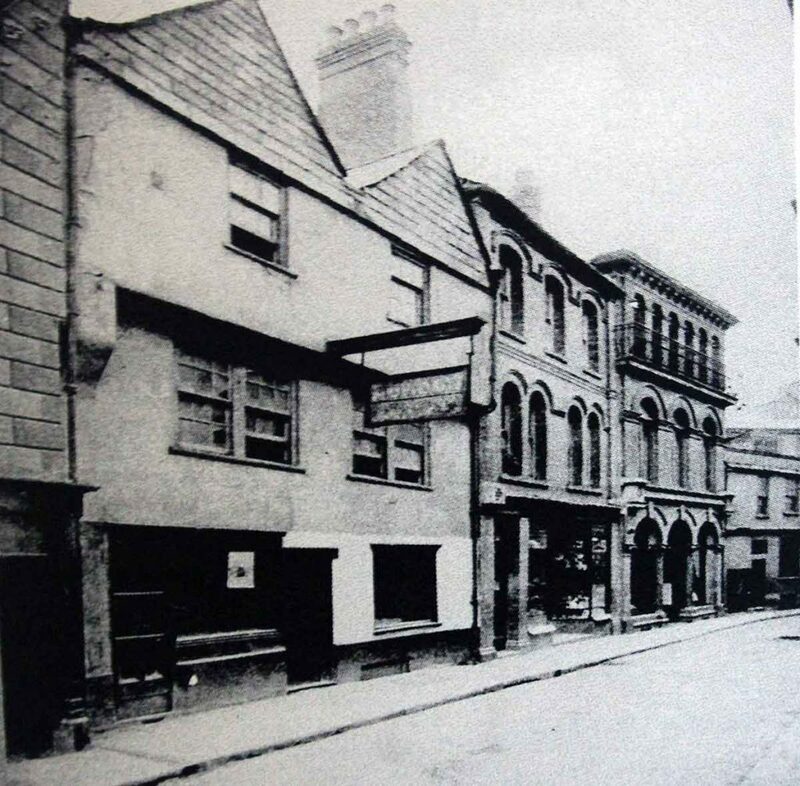 1 and 2, Church Street, which again gives a clue to how the Launceston streets once looked.